Here are some of the beautiful projects that flew from our needles this year and a few others that are on our "Makin' It 4 Me" lists. 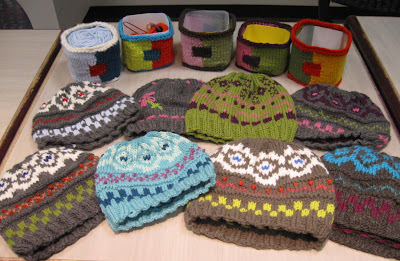 These colorwork hats and Milk Jug boxes are projects from my "Color Knitting II" where students learn and work with Fair Isle and intarsia techniques. The knitters are using their colorwork boxes for all sorts of things—a yarn ball holder, plant box for a poinsettia, and a knit notion box. And, they said they had fun working with the bobbins! Who knew? Fair Isle hats and intarsia boxes. These pretty dish cloths were from a study in stripes and textures in my class, "No Fuss Color Knitting." This class is jam-packed with techniques and projects and includes lessons in color theory. 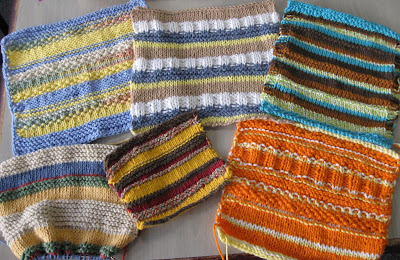 "No Fuss Color Knitting" class design-a-stripe lesson. 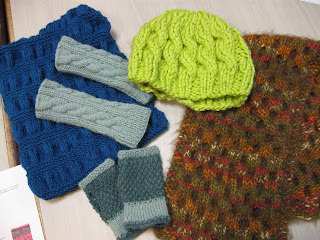 With my "Deanna Wrap" slip stitch project, students learn four different colorwork techniques, how to pick up and knit ribbing and a making a buttonhole. They really enjoyed the slip stitch techniques and found the K1B a bit challenging. The cool thing about the Deanna Wrap is the shaping that occurs naturally by way of the different stitching techniques. Pat included additional rows of pattern to make a longer wrap. She also added an I-cord tie. Lois chose rustic earthtones for her wrap. Two other color schemes for the "Deanna Wrap." 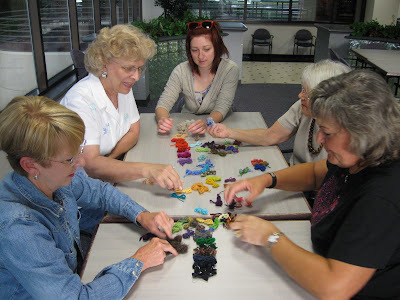 The lesson on color value involved a group exercise. (I always find this one so much fun.) What's not to like about playing with 80+ yarn butterflies?? Students work together on a "Color and Value" lesson. Students ventured into other patterns and projects that inspired them... cables, knit/purl patterns, hats, fingerless mitts, scarves and wraps. Student projects from Show and Tell. 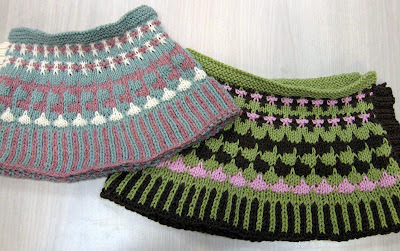 The Retro Cloche (below left) from my "Knitting in the Round" class was made multiple times with different cast-ons, ribbings and embellishments. 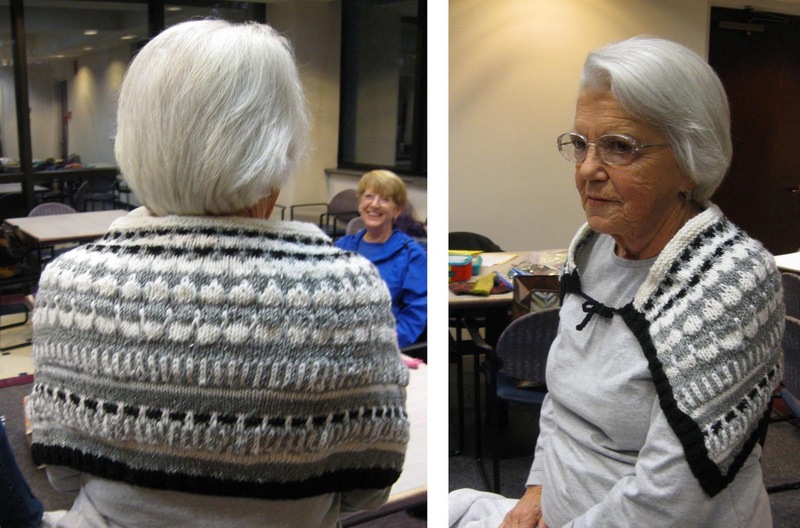 The "Lace Knitting" class gave birth to several successful Design Your Own Scarves made in both sock and worsted weight yarns. A pretty lace fan pattern came from the Madeira Cascade Kid Merino Lace Scarf pattern. And, the Flamboyant Scarf, with its interesting juxtaposition of fine mohair and bulky yarns, employs garter stitch and minimal shaping. It was another favorite quick-knit project of several students. 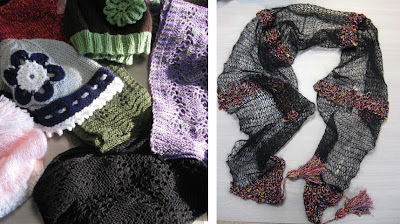 Left: Retro Cloches, lilac lace scarf and a Madeira Lace Scarf in black sock yarn. 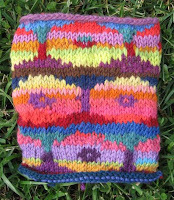 And here is a colorwork swatch (below left) from a workshop I took with Brandon Mably, half of the Knitting with the Color Guys team. Brandon is a total riot in the classroom and the musical accompaniment (his iPhone hooked to a speaker) was a repertoire of all of my favorites. Brandon and Kaffe Fassett's new book will be coming out early next year. Stay tuned. Left: Persian Poppies with Brandon Mably. Right: My own slip stitch gauntlet design. 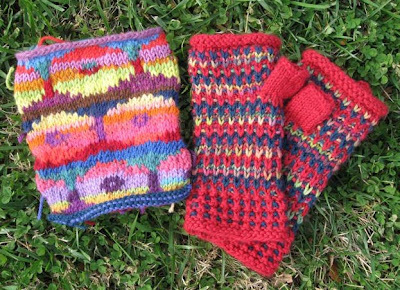 The slip stitch gauntlets (above right) are the outcome of my swatching experiments (yes, I DO swatch!) using the A-B-C color sequence with 2 solids and a long color change variegated. 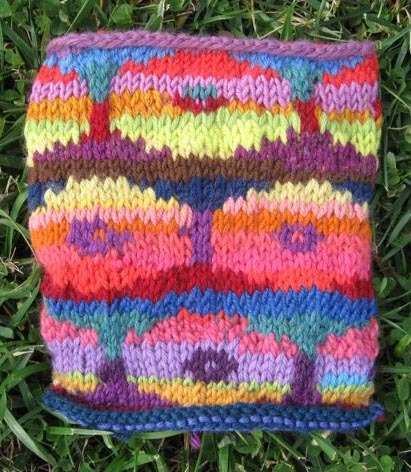 With a little tweaking to the finishing, I think I'll write up the pattern. They were fun! Hope you enjoyed the smorgasbord of color and fiber goodness!